The Todd Nature Reserve in Sarver, PA, is a 175 acre forest and wildlife sanctuary managed by the Audubon Society of Western Pennsylvania. The land once belonged to W.E. Clyde Todd, a passionate bird watcher and Curator of Birds at the Carnegie Museum in the early 1900s who used to bird watch on the property. In an effort to keep the land a wildlife sanctuary for generations to come, Mr. Todd donated the land to the Audubon Society in the 1940s and they have managed it to date. With many hiking trials, a beautiful pond full of frogs, bird watching, and spring wild flowers, there is truly a lot to see at the nature reserve bearing Mr. Todd's name! What you can see at Todd Nature Reserve varies considerably depending on when you visit. If you visit in the spring, the nature reserve is said to be full of beautiful wildflowers including the Trillium. If you visit on Friday mornings from April to September, you can join a guide for a free bird watching tour to learn more about the species seen in the park (and hopefully see a few for yourself)! But if you are like us and visit on a fall afternoon, it is unlikely that you'll see much of the above, and instead get to enjoy many beautiful trees, shrubs, the quaint pond full of frogs (take a telephoto lens! ), and overall get a nice day out and about without any major highlight in particular. 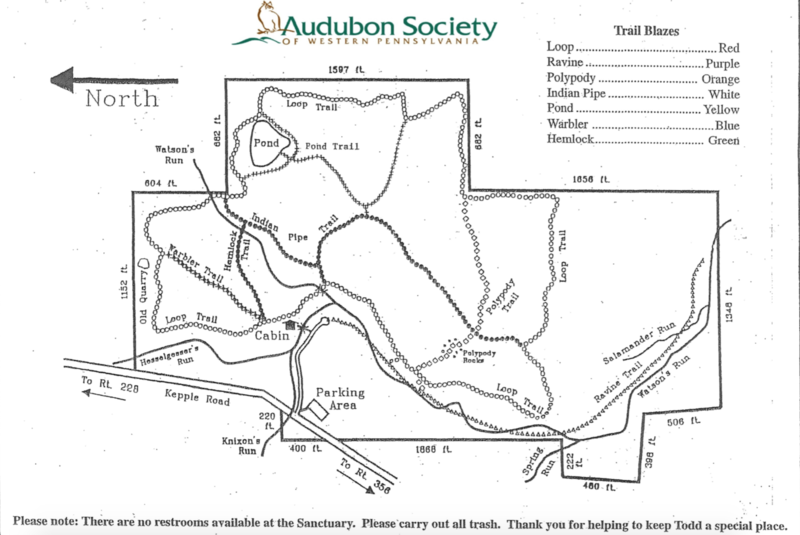 As Todd Sanctuary is managed by the Audubon Society of Western Pennsylvania, you can rest assured that the trails are well kept and easy to navigate. If you park at the lot just off of Kepple Road (the only noted parking area), you enter through one main trail head which goes about a hundred feet before the trail splits at a cabin. If you continue down on without crossing the creek you'll be on the Ravine Trail (purple blazes, an out and back trail) that crosses Watson's Run multiple times before ultimately becoming a dead end. If you cross the creek towards the cabin, you'll enter out onto the Loop Trail (red blazes) that takes about an hour to complete. While on the loop you can pick several other trails that cut across the loop a whole to either explore more features of the park (such as a better view of the pond on the Pond Trail) or to cut your walking time down just a bit. The trails have frequent blazes, roughly every three to five trees, so it is fairly hard to get lost. That being said, we did manage to stumble upon a few trail connectors when we weren't paying attention and the blazes magically changed to yellow and purple without a red blaze in sight. Call it us following a well trodden path while talking and not paying attention, but in both cases we just had to circle back about 20 feet to find a turn we missed. Overall, Todd Nature Reserve is a gorgeous park in Sarver, PA. We had a lovely hour long hike in the fall to see the colorful leaves; however, as the reserve is primarily known for wildflowers (spring time) and bird watching (best in mornings), both things we missed, this is one park that you'll benefit even more from timing your visit accordingly! Todd Nature Reserve is located in Sarver, PA just off of Kepple Road. A trail map for the Todd Nature Reserve can be found here. The nature reserve is closed during deer hunting season from after Thanksgiving through December, and we recommend calling to confirm they are indeed open before visiting. Dogs are typically not allowed at parks managed by the Audubon Society; however, we did see dogs during our visit despite not bringing our own. We visited Todd Nature Reserve as a part of our quest to visit every trail in the local guide book 60 Hikes in 60 Miles: Pittsburgh. If you're looking for more recommendations on where to hike in the region, we highly recommend this book! After your hike, head a few miles down the road for a wine tasting at Winfield Winery!